The primary purpose of this post, is to advise that, as of this writing, a marginally higher high over the Sep 2015 high has been made on the S&P500. That means that several upward counts can now pertain to the market. For example, on this daily chart, minute i, minute ii and minute iii are now valid waves of a potential Leading Diagonal upward for example for the minor wave A of the intermediate (B) wave of a triangle. We have shown those waves as circle-i, circle-ii, and circle-iii, which would mean circle-iv and circle-v would follow if this count would play out. We are writing this mid-day, and the day is not done, so minute iii can go higher - if it wants. We again want to emphasize that this is a valid potential count. For the count to be realized, it must play out according to the definition. That has not occurred yet. However, keep in mind that in Elliott Wave theory, it is 'required' that the all of the legs of a diagonal be zigzags. So that means that since minute i and minute ii must be zigzags for a diagonal, they must also be functionally equivalent to a W-X-Y count : a double zigzag count. That's why on the chart, below, we are showing the same labels simultaneously. At this moment in time, minute i, minute ii, and minute iii of a diagonal are logically and functionally equivalent to a-b-c-x-a-b-c, or W-X-Y. So, strictly on a 'wave labeling' basis it is difficult to tell them apart. So, what then provides a road map for the future? 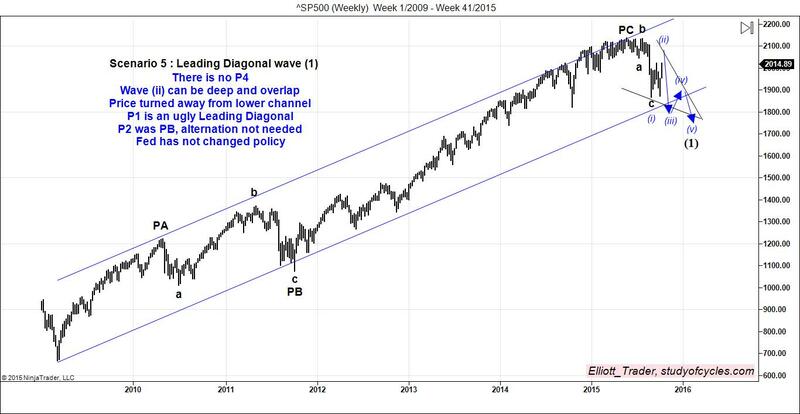 Well, first it is very often a 'third' wave that makes a new high or low in the market. It is the wave with the power. Isn't that what we have here? 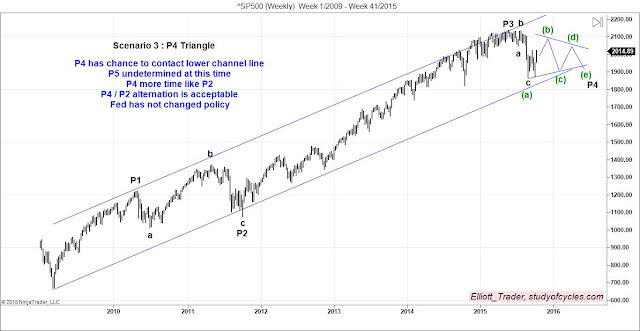 A third wave (in this case of a potential diagonal) making a new high in the market? So, this may be one indicator the current count is correct. However, we also know that in a true contracting leading diagonal, wave iii can not be longer than wave i. So, that IF wave iii were to become longer than wave i, then the better count may simply be W-X-Y. 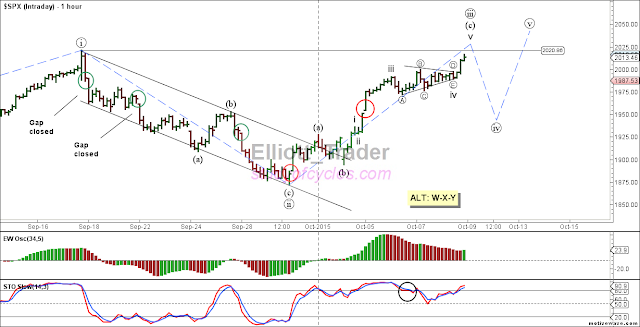 A long enough interior wave could invalidate a diagonal, and upwardly overlap the minor A wave down. It that case then the wave could be long enough to have formed Intermediate (B), of a triangle all by itself. (We want to emphasize, that, at this point in time, no such formation is in evidence, but it 'could' occur.) But it could, emphasize could, also be W-X-Y of a much larger correction like a potential second wave up, although, here again, there is insufficient price evidence to draw such a conclusion at this time. Also if Minor A-B-C, down & W, up provide an almost perfectly parallel channel, then a back test of the channel as minute iv, overlapping minute i, staying shorter than ii, without making lower low than X is also a very plausible scenario. It would continue the pattern of 'whippy' moves in the market. This might then be followed by another zigzag higher to make minute v, which, in a diagonal must then be shorter than minute iii. Ok. Fine, but there are two problems here, too. The first is that diagonals should be relatively rare patterns. And, do you see the second problem here? 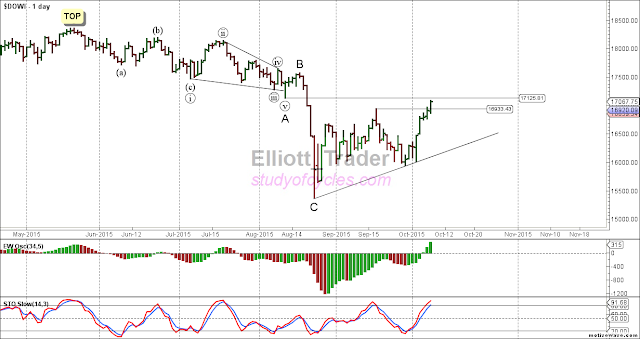 In such a scenario, then the equivalent pattern is W-X-Y-X-Z which could be just a triple zigzag to make intermediate (B) of a triangle - formed of zigzags high enough to have the S&P500 overlap with it's minor wave A, down. For this reason, it takes a keen view of market oscillators, technical internals, channels and Bollinger bands to sort things out at this time. From our vantage point, we simply wanted to use this live example to show exactly why there are often 'alternates' in a market. Just part of the reason, is that in Elliott Wave counting 1-2-3 is often equivalent to A-B-C (until it isn't by adding a fourth and fifth wave), and a diagonal must be comprised of double and triple zigzags. Because some people keep posting the same information in chat rooms, repeatedly, and because others think I am some kind of Elliott Wave monster - out to seek and destroy other chat rooms - or that I claim that my counts are 'always correct', or others say I am here to promote myself, I want to use that energy to update with this post. With apologies to 'A Hitch-Hiker's guide to the Galaxy', I am going to offer you these six realistic Elliott Wave scenarios, any of which 'could' occur without any breaking of the Elliott Wave rules. There may be others I have missed. If there are, let me know. Clearly because they are offered for free, and also because I am not selling anything (check my web site- any and all 'Products' for sale have been removed), I hope it reduces the perception of any pandering or self-interest, other than that people actually learn to count Elliott Waves, as they are described in the texts. Why am I doing this now? First, because this is the most difficult time in history to make good Elliott wave predictions. The market will lurch & jolt; it will cause gains and losses, it will cause people to have a surge in optimism of new highs, and then it will disappoint with overlaps of some kind. If you can learn to survive in this environment, then counting impulse waves higher or lower, will seem like a walk in the park at some later point in future. The second reason I am posting this, now, is people almost always drag out the very tired comparison to Robert Prechter. Saying, "you know he thought he was always right, too" or some other such nonsense. The fact is Prechter's organization has almost always posted alternate counts, whether you want to acknowledge that or not, or whether you wanted to use them or not! So, please take that argument and use it on someone else. The third reason is that people keep telling me that because, somehow, a wave did not conform to my expectations that it means that you can't possibly trade using it! Bingo! I agree with that statement to some - even a large - degree. I have made an entire video, posted on YouTube, about "A Critique of Using Elliott Wave for Trading", particularly if it is used alone or in isolation. If you haven't watched it, you should! We are in that period now called "The Fourth Wave Conundrum" in that video: many, many options. And I maintain, that when a wave label invalidates it provides a lot of information for the future. So, without further delay, here are six plausible scenarios for the future. You will have to decide what you like and what you don't like, and let the market decide the outcome. Clearly for this scenario, you have to think there have been three Primary waves of a Cycle Impulse upward to at or beyond P3 = 1.618 x P1. That's fine it might work that way in the U.S. It's just not working that way for the London FTSE. One reason to question this scenario is how short P5 would be in relation to P1. It's not a 'deal-breaker' though. It could happen. It just needs five waves up from P4. Other comments are on the chart. This chart has many of the same features as the prior one - just that P5 is allowed to take on a more reasonable length in relationship to P1. Who knows, perhaps P5 would produce a "throw-over" of the channel that would end the move - like the Gold market did. It's plausible. The one thing about this chart is it ignores the overhead supply of the seven month diagonal from last November to this May. One advantage to this chart is that P4 is allowed to consume more time in relationship to P2, and price is allowed to contact the lower channel line, and perhaps make a 'false breakout below it' while still producing acceptable alternation in the count. This scenario allows price not only to contact the lower channel line, but also re-define it. In other words, we would re-draw the P2 to P4 trend line, when we 'know' where the new P4 is. Then P5 could head upward, and make a wave that is more like P5 = P1. It might also allow a 38.2% retrace of P3 in the U.S., but it might mean more ugliness in foreign markets. This scenario would be ugly, indeed, because a deep retrace for a second wave (ii) of a diagonal would have most convinced that new highs are in the offing - yet this scenario would both recognize the overhead supply created, and allow the S&P500 to validate it's ending diagonal triangle - that formed in May, 2015 - like many other stock indexes have done. It would also recognize the extreme leverage and number of people that participate in the market via the ES futures rather than buying traditional stocks, for example. In this scenario, wave (ii), to follow the rules, must now form with a similar structure as wave (B) of the triangle, start with a Leading Diagonal, A, then retrace for a B, then make a C wave up to form a legitimate zigzag. 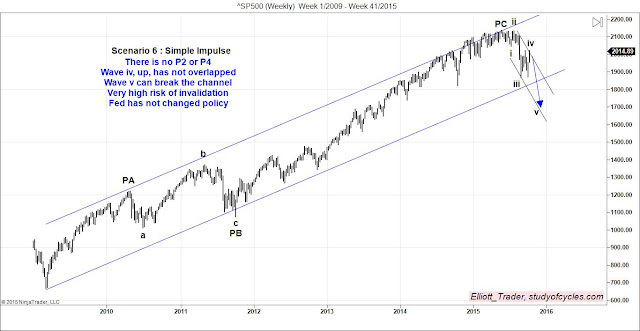 It's funny, but the wave iv of a simple impulse downward has 'not yet invalidated'. Certainly, it has a high risk of doing so - which is why it is presented last. But, still, we can not rule it out just yet. The Dow is only points away. If we can rule it out, we get to take one scenario "off the table". If not, that will tell us something, too. So, here are six scenarios. And you might ask, "what's the point"? 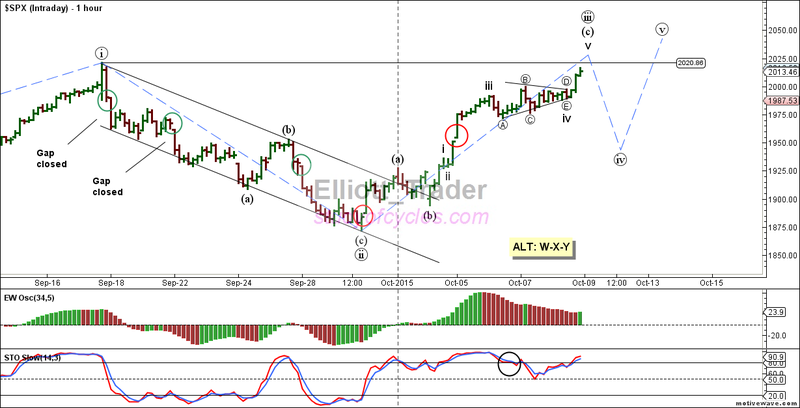 The point is that based on Elliott Wave theory it is 'very to hard say' where exactly one is in the wave count. But it is 'largely' because the down movement consisted of, or started with, three waves down. That very same 'conundrum' happens on all degrees of wave counting - whether you want to accept it or not. That's why Bill Williams developed some indicators that can help in that decision and why they are incorporated into some products like Advanced GET, E-Signal or Motivewave (I have no business relationship with any of them). Yes, as of Friday momentum looks up. Want to fight that? That's up to you. So, if it's hard to tell where one is, one might want to at least remain flexible, do the best job of short-term wave counting possible, and, if possible, let the market clear up some of the confusion.! Cheers and the best to you always! When you ask someone for some information - if you do not inquire politely enough - it is sometimes referred to as giving them "the third degree". Politely or not, can we inquire as to where the market is in it's hourly count? In Tuesday's post, we clearly said that if the Dow made a higher high than the September high, then it would officially take all downward diagonals off of the table. Yesterday, the Dow did that, and in live chat room, and elsewhere, we removed the downward diagonal possibility and upped the odds of a Primary fourth wave in progress. We are currently at 70:30, that a Primary 4th wave is in progress. We have shown in our weekend video, that if we are to make a Primary fourth wave triangle, there needs to be a clear Intermediate (B) wave up, that would start with a minor wave A. Originally, we were looking for a Leading Diagonal, upward. The first attempt at that count invalidated at two different levels. But, because of the look of the Dow's chart, in particular, and the position of the Bollinger Bands on the S&P 500, we are putting a Leading Diagonal Minor wave A back on the table. In the chart below, you can see the S&P 500 has not yet made the higher high, but we would expect it to. Yet, the question is, can we better tell where we are in the hourly count? One key might be a structure in the 'fourth degree' .. well in the fourth wave position. If you examine this chart closely, you can see a structure that we have clearly labeled as a five-wave triangle (A,B,C,D,E,) and wave iv. If the triangle is properly located in a wave iv, then it should precede the 'last wave up' in this wave sequence. Assuming a new high is made, then it is very possibly wave minute iii of such a Leading Diagonal. Since we never did count the September downward sequence as a 'five' and only as a 'three', then a diagonal structure can, in fact, still be on the table. Of course, the requirements remain the same as for all diagonals. Minute wave iii (circle iii) must remain smaller than minute wave i, and minute wave iv must remain smaller than minute wave ii. Minute wave iv must then overlap minute wave i, in the downward direction, and minute wave v, up, must remain smaller than minute wave iii. 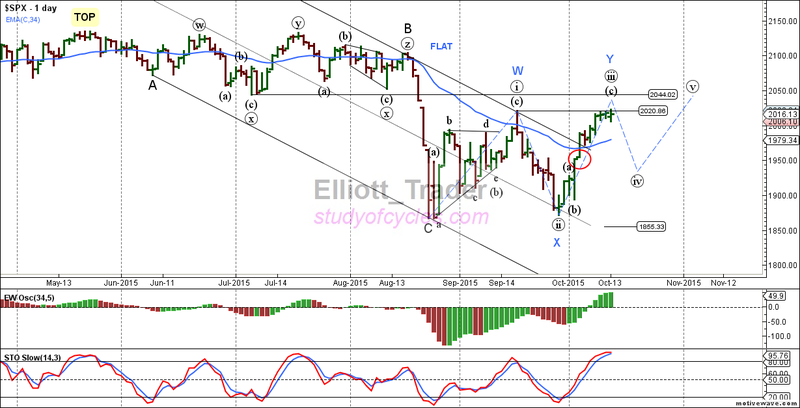 With further upward movement the Dow will overlap it's first downward minor wave (minor wave A). If the overlap occurs, it may be enough to only consider the upward movement as a simpler W-X-Y of Intermediate (B) rather than requiring a full Leading Diagonal would form. So, we have clearly labeled this alternate count on the S&P 500. But, note the position of the daily slow stochastic being in over-bought territory. The Dow's downward retrace in September was nowhere near as deep as the SP500's. Because the two counts are not in lock-step, it may be necessary for the S&P 500 to form a Leading Diagonal in order to effect a legitimate first wave higher, minor A. 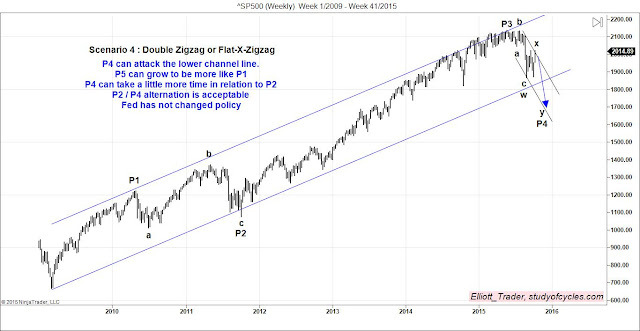 Whether a leading diagonal or W-X-Y, the market will have to tell us through valid formations which count is in play. In either case, the upward diagonal possibility would invalidate below the respective September lows.